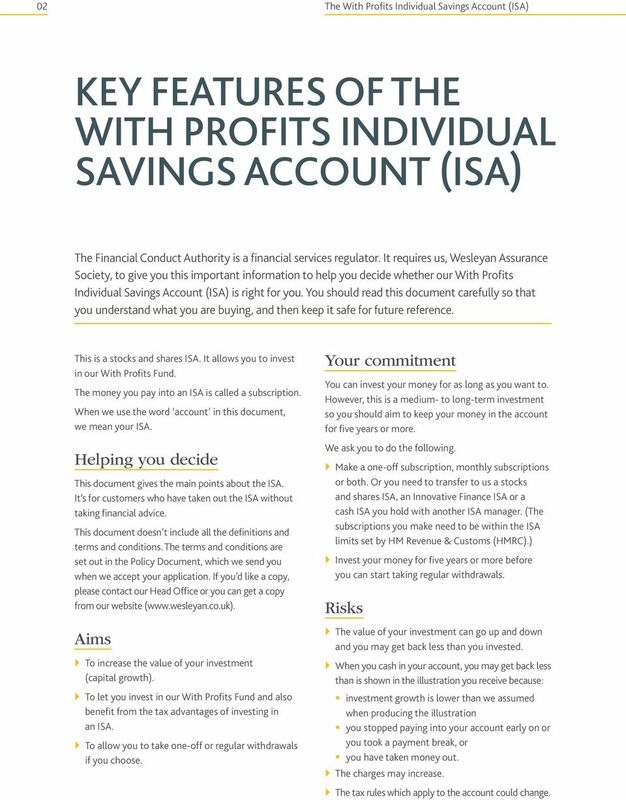 Download "THE WITH PROFITS INDIVIDUAL SAVINGS ACCOUNT (ISA)"
2 02 The With Profits Individual Savings Account (ISA) KEY FEATURES OF THE WITH PROFITS INDIVIDUAL SAVINGS ACCOUNT (ISA) The Financial Conduct Authority is a financial services regulator. 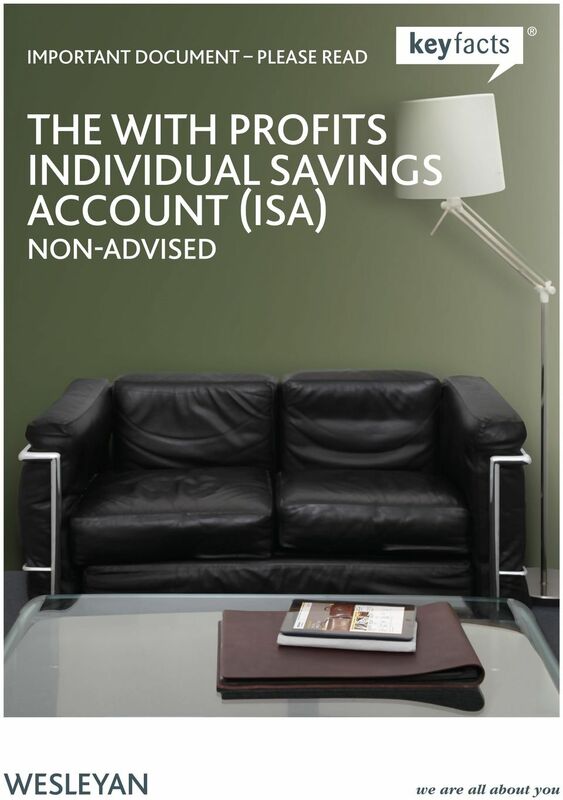 It requires us, Wesleyan Assurance Society, to give you this important information to help you decide whether our With Profits Individual Savings Account (ISA) is right for you. You should read this document carefully so that you understand what you are buying, and then keep it safe for future reference. This is a stocks and shares ISA. It allows you to invest in our With Profits Fund. The money you pay into an ISA is called a subscription. When we use the word account in this document, we mean your ISA. Helping you decide This document gives the main points about the ISA. 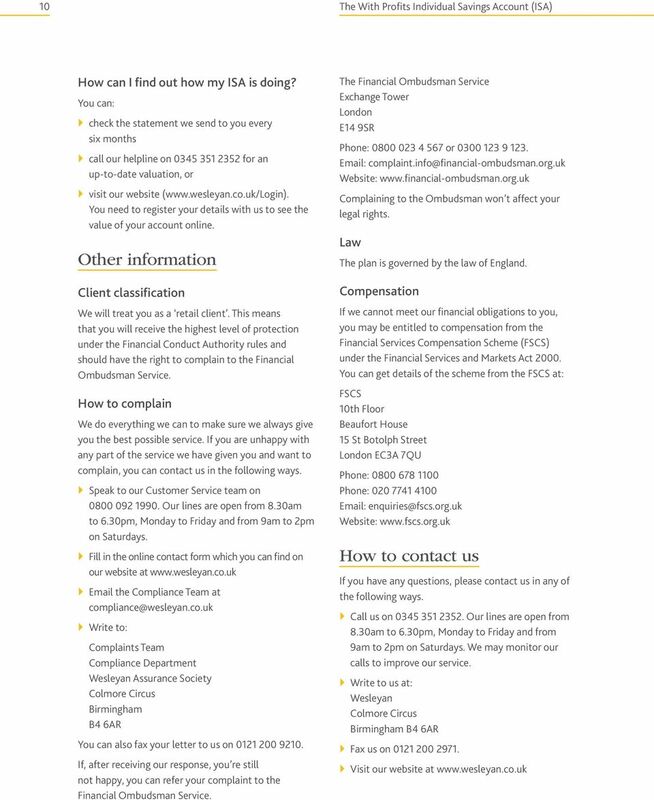 It s for customers who have taken out the ISA without taking financial advice. This document doesn t include all the definitions and terms and conditions. The terms and conditions are set out in the Policy Document, which we send you when we accept your application. If you d like a copy, please contact our Head Office or you can get a copy from our website ( Aims To increase the value of your investment (capital growth). To let you invest in our With Profits Fund and also benefit from the tax advantages of investing in an ISA. To allow you to take one-off or regular withdrawals if you choose. Your commitment You can invest your money for as long as you want to. However, this is a medium- to long-term investment so you should aim to keep your money in the account for five years or more. We ask you to do the following. Make a one-off subscription, monthly subscriptions or both. Or you need to transfer to us a stocks and shares ISA, an Innovative Finance ISA or a cash ISA you hold with another ISA manager. (The subscriptions you make need to be within the ISA limits set by HM Revenue & Customs (HMRC).) Invest your money for five years or more before you can start taking regular withdrawals. Risks The value of your investment can go up and down and you may get back less than you invested. When you cash in your account, you may get back less than is shown in the illustration you receive because: investment growth is lower than we assumed when producing the illustration you stopped paying into your account early on or you took a payment break, or you have taken money out. The charges may increase. The tax rules which apply to the account could change. 3 03 If you transfer money into the Wesleyan With Profits ISA: there could be a rise in the markets while we are processing your transfer, which means you could miss out on an increase in the value of your investment you could have to pay charges and other costs associated with the transfer there is no guarantee that your investment will perform better after the transfer than where it is currently invested, and there may be a higher or lower investment risk than with your current ISA. 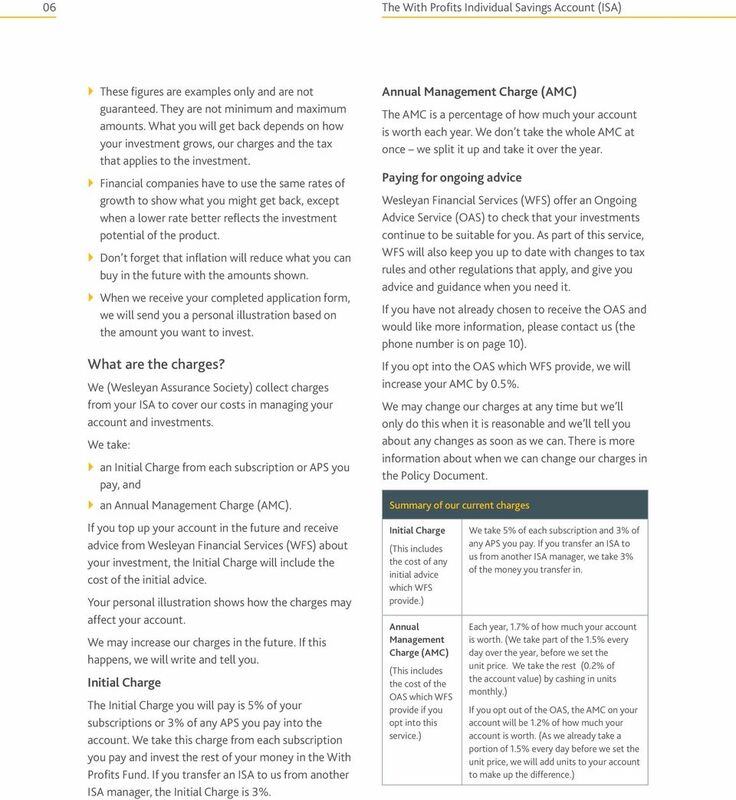 If you make a one-off subscription or you transfer an ISA from another ISA manager and you cancel the subscription or transfer during the cancellation period, you may get back less than you invested if we are applying a market value reduction when we receive your Cancellation Notice (this is a form we send to you with your account documents). For more information about market value reductions, see What is a market value reduction? on page 8. Questions and answers What is an ISA? An ISA is a type of savings account with tax advantages. ISAs are sometimes called tax wrappers. This means that the ISA is wrapped around the investment you have in it so you pay less or no tax. HMRC set how much you can invest each tax year in an ISA. (The tax year runs from 6 April one year to 5 April the following year.) You don t have to pay income tax on any income you receive from your ISA. You don t have to pay capital gains tax on any money you make from your ISA. You can invest in a stocks and shares ISA, a cash ISA, an Innovative Finance ISA or a combination of all three types during the year. You can choose one ISA manager for each ISA type. Who can take out a Wesleyan With Profits ISA? You can open a With Profits ISA if you are: resident in the UK (for tax purposes), and aged 18 to 74. If you are not sure if you qualify to open a With Profits ISA, please contact us. You can subscribe to (invest in) the With Profits ISA if you have not already subscribed to a stocks and shares ISA in the current tax year. Can I use the Wesleyan With Profits ISA to make use of an increased ISA allowance I ve inherited? Yes, you can use your existing Wesleyan With Profits ISA to make use of an increased ISA allowance called an Additional Permitted Subscription (APS), but only if your husband, wife or registered civil partner has died on or after 3 December 2014, holding one or more ISAs. You cannot use APS contributions to open a new Wesleyan With Profits ISA without first taking advice from a Wesleyan Financial Consultant. 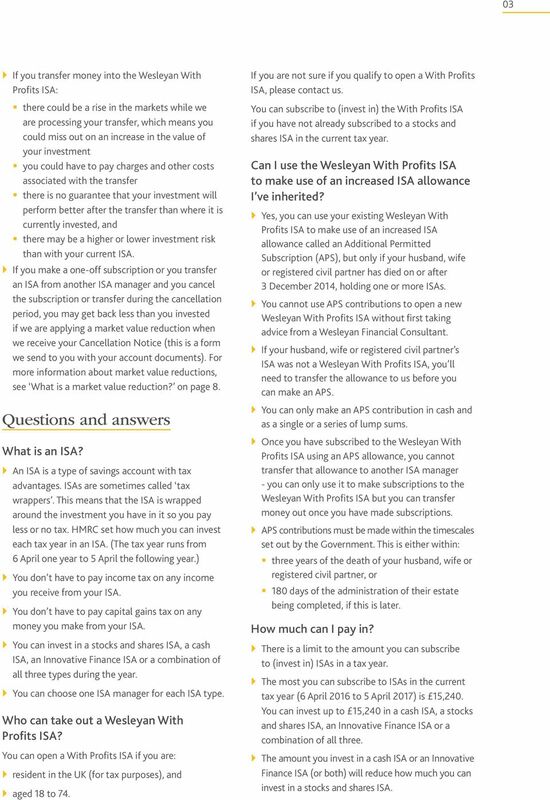 If your husband, wife or registered civil partner s ISA was not a Wesleyan With Profits ISA, you ll need to transfer the allowance to us before you can make an APS. You can only make an APS contribution in cash and as a single or a series of lump sums. 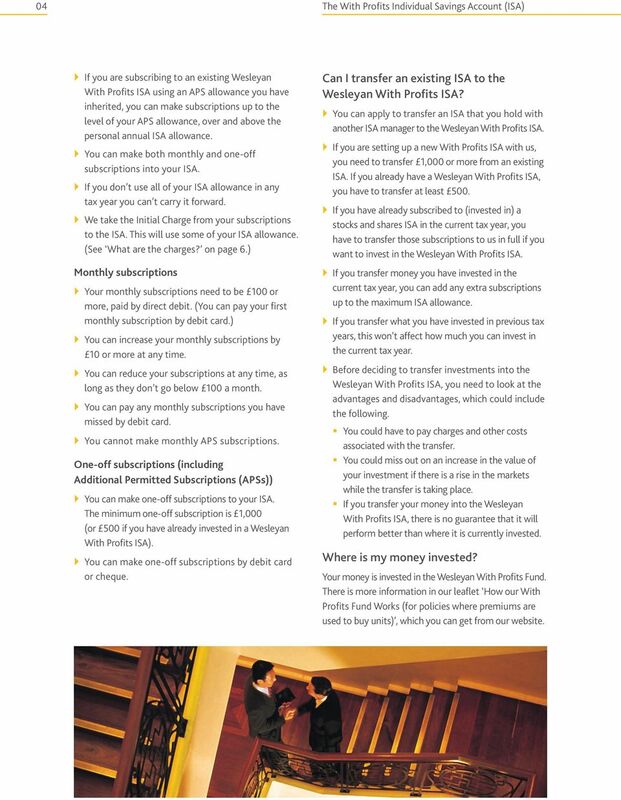 Once you have subscribed to the Wesleyan With Profits ISA using an APS allowance, you cannot transfer that allowance to another ISA manager - you can only use it to make subscriptions to the Wesleyan With Profits ISA but you can transfer money out once you have made subscriptions. APS contributions must be made within the timescales set out by the Government. This is either within: three years of the death of your husband, wife or registered civil partner, or 180 days of the administration of their estate being completed, if this is later. How much can I pay in? There is a limit to the amount you can subscribe to (invest in) ISAs in a tax year. The most you can subscribe to ISAs in the current tax year (6 April 2016 to 5 April 2017) is 15,240. You can invest up to 15,240 in a cash ISA, a stocks and shares ISA, an Innovative Finance ISA or a combination of all three. } } The amount you invest in a cash ISA or an Innovative Finance ISA (or both) will reduce how much you can invest in a stocks and shares ISA. 4 04 The With Profits Individual Savings Account (ISA) If you are subscribing to an existing Wesleyan With Profits ISA using an APS allowance you have inherited, you can make subscriptions up to the level of your APS allowance, over and above the personal annual ISA allowance. You can make both monthly and one-off subscriptions into your ISA. If you don t use all of your ISA allowance in any tax year you can t carry it forward. We take the Initial Charge from your subscriptions to the ISA. This will use some of your ISA allowance. (See What are the charges? on page 6.) Monthly subscriptions Your monthly subscriptions need to be 100 or more, paid by direct debit. (You can pay your first monthly subscription by debit card.) You can increase your monthly subscriptions by 10 or more at any time. You can reduce your subscriptions at any time, as long as they don t go below 100 a month. You can pay any monthly subscriptions you have missed by debit card. You cannot make monthly APS subscriptions. One-off subscriptions (including Additional Permitted Subscriptions (APSs)) You can make one-off subscriptions to your ISA. The minimum one-off subscription is 1,000 (or 500 if you have already invested in a Wesleyan With Profits ISA). You can make one-off subscriptions by debit card or cheque. Can I transfer an existing ISA to the Wesleyan With Profits ISA? You can apply to transfer an ISA that you hold with another ISA manager to the Wesleyan With Profits ISA. If you are setting up a new With Profits ISA with us, you need to transfer 1,000 or more from an existing ISA. If you already have a Wesleyan With Profits ISA, you have to transfer at least 500. If you have already subscribed to (invested in) a stocks and shares ISA in the current tax year, you have to transfer those subscriptions to us in full if you want to invest in the Wesleyan With Profits ISA. If you transfer money you have invested in the current tax year, you can add any extra subscriptions up to the maximum ISA allowance. If you transfer what you have invested in previous tax years, this won t affect how much you can invest in the current tax year. Before deciding to transfer investments into the Wesleyan With Profits ISA, you need to look at the advantages and disadvantages, which could include the following. You could have to pay charges and other costs associated with the transfer. You could miss out on an increase in the value of your investment if there is a rise in the markets while the transfer is taking place. If you transfer your money into the Wesleyan With Profits ISA, there is no guarantee that it will perform better than where it is currently invested. Where is my money invested? Your money is invested in the Wesleyan With Profits Fund. There is more information in our leaflet How our With Profits Fund Works (for policies where premiums are used to buy units), which you can get from our website. 5 05 Can I take some money out? You can take money out of your account at any time. You must always leave at least 1,000 in your account, otherwise we ll close it. If, however, you have 1,000 or less in your account, we won t close it if you are paying monthly subscriptions or taking regular withdrawals. 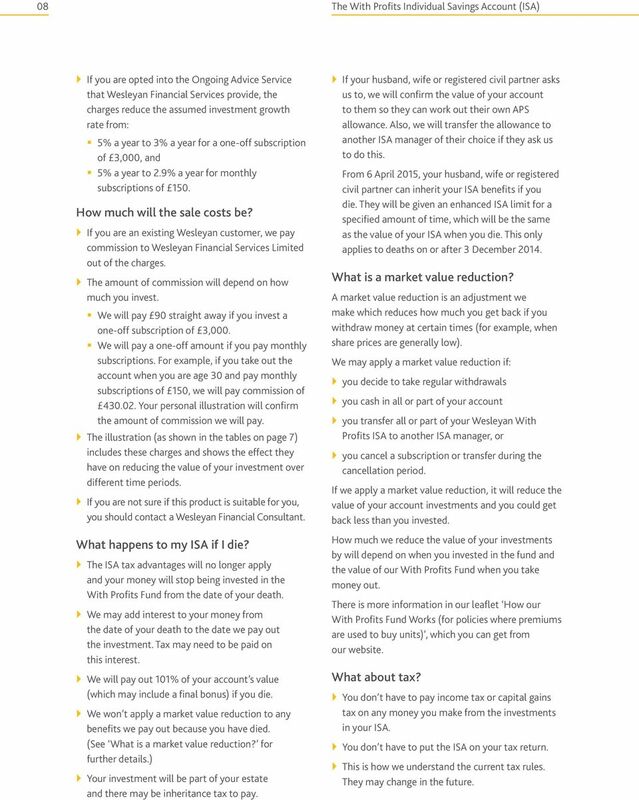 When you have taken money out, you can t put it back into your ISA if that would take you over the maximum you re allowed to subscribe (invest in) for the tax year. We don t charge you for taking money out. However, we may apply a market value reduction which will reduce the value of your account. (See What is a market value reduction? on page 8 for further details.) Regular withdrawals After five years, you can take regular withdrawals from your account. Withdrawing money from your account will reduce the value of your remaining investments. You can take regular withdrawals every month, every three months, every six months or every year. To pay the withdrawal we cash in units from your account. The minimum regular withdrawal you can take out is 50 a month ( 600 a year). We may apply a market value reduction when you take regular withdrawals. (See What is a market value reduction? on page 8.) We will pay regular withdrawals straight into your bank account. One-off withdrawals You can withdraw 500 or more from your account at any time by writing to us. We will pay one-off withdrawals by cheque. How do I cash in my account? You can withdraw all of your money by writing and telling us that you want to do this. We will close your account and send you a cheque. If you cash in your account we may apply a market value reduction. (See What is a market value reduction? on page 8 for further details.) How much might I get back? How much your account is worth, if you decide to cash it in, depends on a number of things, including: how much you ve invested how much you ve already taken out how long your money has been invested for how well your investments have performed, and the level of our charges. We may add regular bonuses and a final bonus to your account. There is more information about bonuses in our leaflet How our With Profits Fund Works (for policies where premiums are used to buy units), which is on our website. We may apply a market value reduction if you take regular withdrawals or you cash in all or part of your account. (See What is a market value reduction? on page 8.) You may get back less than you invested. The table below shows what you could get back if you invest a one-off subscription of 3,000 or monthly subscriptions of 150 over 10 years. Illustrated cash-in values Assumed growth rate Cash-in value after 10 years Assumed growth rate Cash-in value after 10 years One-off subscription of 3,000 2% a year 5% a year 8% a year 3,080 4,110 5,450 Monthly subscriptions of 150 2% a year 5% a year 8% a year 17,700 20,700 24,100 } } The figures in the table above assume that you are not opted into the Ongoing Advice Service that Wesleyan Financial Services provide. If you are opted into this service, the illustrated cash-in values (shown in the table) will be lower. For example, if the assumed growth rate is 5%, the illustrated cash-in value after 10 years for a one-off subscription of 3,000 is 3,910, and the illustrated cash-in value for monthly subscriptions of 150 after 10 years is 20,100. 7 07 How will the charges affect my investment? The table below and the one opposite show the effect of our charges over 25 years on the subscription amounts shown. These figures assume that the investment grows at 5% a year, you do not take any withdrawals and you are not opted into the Ongoing Advice Service (OAS) that Wesleyan Financial Services provide. (If you are opted into this service, please ask us for a separate illustration to show how the charges will affect your subscriptions.) At end of year One-off subscription of 3,000 Total paid in to date Total actual charges to date Effect of charges to date What you might get back 1 3, , , , , , , , , , , , , ,280 4, ,000 1,190 2,010 5, ,000 1,590 3,010 7,140 At end of year Monthly subscriptions of 150 Total paid in to date Total actual charges to date Effect of charges to date 1 1, ,740 What you might get back 2 3, , , , , , , , ,000 2,120 2,540 20, ,000 4,270 5,600 34, ,000 7,330 10,500 50, ,000 11,400 17,900 70,200 What are the charges for? The charges include the cost of setting up, arranging and managing the account. We also apply an AMC charge to help us meet the costs of running the With Profits Fund. 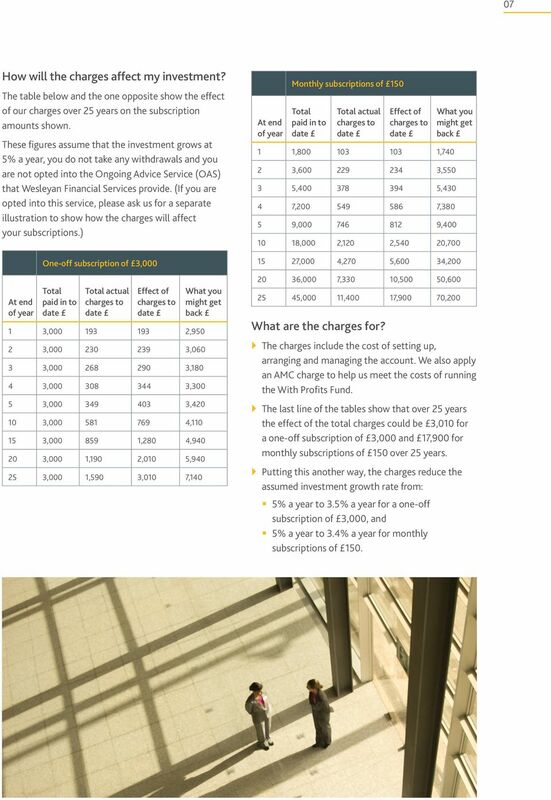 The last line of the tables show that over 25 years the effect of the total charges could be 3,010 for a one-off subscription of 3,000 and 17,900 for monthly subscriptions of 150 over 25 years. Putting this another way, the charges reduce the assumed investment growth rate from: 5% a year to 3.5% a year for a one-off subscription of 3,000, and 5% a year to 3.4% a year for monthly subscriptions of 150. 8 08 The With Profits Individual Savings Account (ISA) If you are opted into the Ongoing Advice Service that Wesleyan Financial Services provide, the charges reduce the assumed investment growth rate from: 5% a year to 3% a year for a one-off subscription of 3,000, and 5% a year to 2.9% a year for monthly subscriptions of 150. How much will the sale costs be? If you are an existing Wesleyan customer, we pay commission to Wesleyan Financial Services Limited out of the charges. The amount of commission will depend on how much you invest. We will pay 90 straight away if you invest a one-off subscription of 3,000. We will pay a one-off amount if you pay monthly subscriptions. For example, if you take out the account when you are age 30 and pay monthly subscriptions of 150, we will pay commission of Your personal illustration will confirm the amount of commission we will pay. The illustration (as shown in the tables on page 7) includes these charges and shows the effect they have on reducing the value of your investment over different time periods. If you are not sure if this product is suitable for you, you should contact a Wesleyan Financial Consultant. What happens to my ISA if I die? The ISA tax advantages will no longer apply and your money will stop being invested in the With Profits Fund from the date of your death. We may add interest to your money from the date of your death to the date we pay out the investment. Tax may need to be paid on this interest. We will pay out 101% of your account s value (which may include a final bonus) if you die. We won t apply a market value reduction to any benefits we pay out because you have died. (See What is a market value reduction? for further details.) Your investment will be part of your estate and there may be inheritance tax to pay. If your husband, wife or registered civil partner asks us to, we will confirm the value of your account to them so they can work out their own APS allowance. Also, we will transfer the allowance to another ISA manager of their choice if they ask us to do this. From 6 April 2015, your husband, wife or registered civil partner can inherit your ISA benefits if you die. They will be given an enhanced ISA limit for a specified amount of time, which will be the same as the value of your ISA when you die. This only applies to deaths on or after 3 December What is a market value reduction? A market value reduction is an adjustment we make which reduces how much you get back if you withdraw money at certain times (for example, when share prices are generally low). 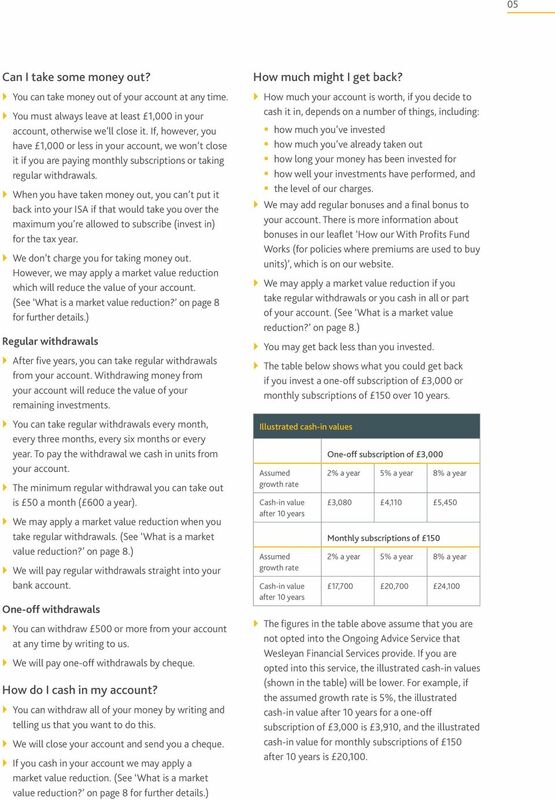 We may apply a market value reduction if: you decide to take regular withdrawals you cash in all or part of your account you transfer all or part of your Wesleyan With Profits ISA to another ISA manager, or you cancel a subscription or transfer during the cancellation period. If we apply a market value reduction, it will reduce the value of your account investments and you could get back less than you invested. How much we reduce the value of your investments by will depend on when you invested in the fund and the value of our With Profits Fund when you take money out. There is more information in our leaflet How our With Profits Fund Works (for policies where premiums are used to buy units), which you can get from our website. What about tax? You don t have to pay income tax or capital gains tax on any money you make from the investments in your ISA. You don t have to put the ISA on your tax return. } } This is how we understand the current tax rules. They may change in the future. 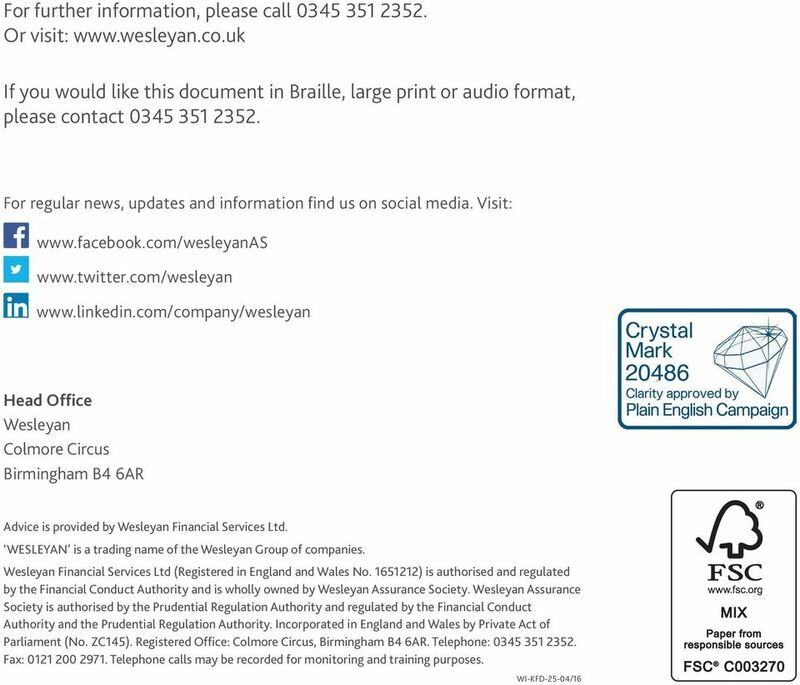 9 09 Can I transfer my Wesleyan With Profits ISA to another ISA manager? You can transfer all or part of your Wesleyan With Profits ISA to another ISA manager at any time. Before deciding to transfer, you need to remember that we may apply a market value reduction to the value of your investment before it is transferred. (See What is a market value reduction? on page 8.) What happens if I stop paying? You can stop paying monthly subscriptions at any time. If the value of your account is less than 1,000 when you stop your monthly subscriptions and you are not taking regular withdrawals, we will close your account and pay the value to you. We will reduce the value of the investments in your account if a market value reduction applies when we close your account. (See What is a market value reduction? on page 8.) Can I change my mind? Yes, you can change your mind. Simply fill in the Cancellation Notice (this is a form we send to you with your account documents) and return it to us within 30 days of the date you received it. 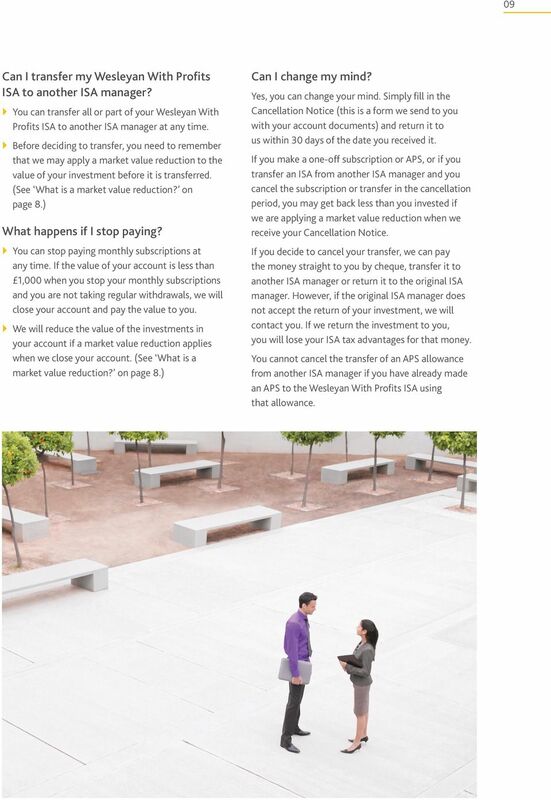 If you make a one-off subscription or APS, or if you transfer an ISA from another ISA manager and you cancel the subscription or transfer in the cancellation period, you may get back less than you invested if we are applying a market value reduction when we receive your Cancellation Notice. If you decide to cancel your transfer, we can pay the money straight to you by cheque, transfer it to another ISA manager or return it to the original ISA manager. However, if the original ISA manager does not accept the return of your investment, we will contact you. If we return the investment to you, you will lose your ISA tax advantages for that money. You cannot cancel the transfer of an APS allowance from another ISA manager if you have already made an APS to the Wesleyan With Profits ISA using that allowance. Stocks & Shares ISA Key Facts. This is an important document which you should keep.